Welcome to “Nasty Drum Licks” #124 and #125. 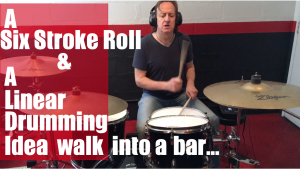 The six-stroll roll in this lesson refers to the left-handed version (LRRLLR) and the linear idea is something I’ve been playing for a while now (FLRLFR). I came up with the linear thing as a way to play something kind of slick-sounding while grooving on the hi-hat, snare and bass drum. The reason these two seemingly unrelated patterns are presented together is that—as you’ll see in the video—they work together really well. It’s very natural to play one right next to the other. The ideas work individually really well too. Here’s the PDF with all the ideas I play in the video written out note-for-note: Nasty Licks 124 and 125. There are also two bonus ways of playing them (#’s 8 and 9 on the PDF), that I don’t play in the video. Check it out and let me know what you think in the comments here or on YouTube.